We’ve just launched our 2018 Cwtch Wedding Photography Workshop and we’ve picked the most amazing location…. Venice!! So this is the plan…. 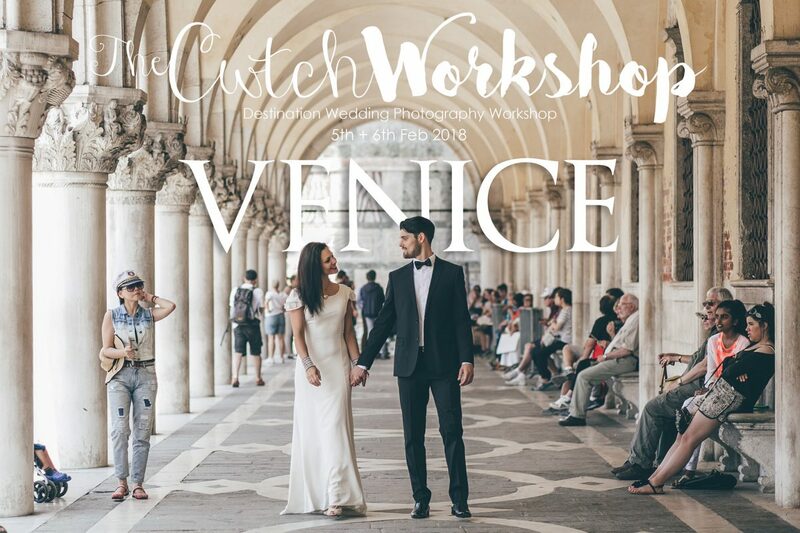 2 of us + 10 of you, one gorgeous couple and THE most amazing backdrop of Venice! We’ve also got Lola from Walnut and Willow styling the shoot…plus the bonus of being smack bang in the middle of the Venice Carnival! Day One – we’ll spend the morning cwtched up on some sofas with a cuppa, discussing topics that we believe are essential to being successful in the wedding industry, including the best ways to market yourself and tips on generating wedding enquiries. Then after some pizza for lunch, we’ll head out into the streets of Venice with our amazing models, and we’ll look at posing without posing, keeping it natural, working in new unexpected locations, thinking on your feet, and working in natural light. After all that talking and shooting, we’ll have a well deserved few drinks, and an early night… ready for day two! Day Two – we’ll be meeting up with our models at 5am (!) think Gucci Guilty advert… strolling around Piazza San Marco, just us and the pigeons, before the streets come alive! After some brunch, we’ll sit down with a coffee again and look at post shoot processes and a bit of how we edit. The rest of the afternoon, we’ll check out the carnival and do some street photography. You will have the opportunity to work with both of us on the location shoot, we’ll share with you how we like to shoot. We’ll give you the chance to direct, lead & create your own set ups, whilst being guided by us, but making sure everyone gets their turn to take the lead and get the shot they want. c) just fancy a trip to the most amazing city in the world! No photographer will ever know it all. We are still and will always be learning. We’ve both built our businesses from starting off as part-time portrait photographers to being full-time wedding photographers. We want to share with you what we’ve learnt so far, the mistakes we made, and the successes we found, to inspire you to build your own business. You will come away from this workshop energised, motivated and educated with the knowledge you need to take your business to the next level, from how to market your business aimed at YOUR target market, how your website and branding can help attract your clients and relate to your photography style. You will also gain an amazing collection of beautiful images to display proudly on your website and social media, to attract new clients at a price point and level which you are aiming for. You will have access to our private Facebook group, and we’re pretty sure you’ll make some new friends! We hope you are comfortable with the manual settings on your camera, but if there’s any thing you’re unsure of, I’m sure we can help. All you need to bring with you is your camera, favourite lenses, and your passport!! Our workshop is taking place in Venice, Italy, Monday 5th and Tuesday 6th of February 2018. We will be arriving Sunday evening for a get together for anyone who wants to join us and flying home lunch time Wednesday 7th. But you are more than welcome to make it a longer trip if you wish. We ask for a £200 non-refundable booking fee to secure your space and the balance is due 4 weeks before the workshop. The fee of £395 includes the workshop, lunch, and lots of laughs. Flights, transfers and accommodation are NOT included in the price. If you are interested in joining the most informative and fun workshop in the most incredible city in the world, please click the link to BOOK or drop us an email – cwtchworkshop@gmail.com – seats are limited to 10 attendees. Something exciting is happening… keep your eyes peeled!